"I love animals." We’ve all seen and heard this many times. It is heartwarming to hear that someone has love for the beautiful creatures with whom we share the planet. It is important, however, to make sure that there is consistency in this love, that this love is honest and informed, and that the ethical “disconnect” between this statement and one’s reality is minimized. One of the biggest disconnects is saying that you love animals, while you continue to eat them. There are several reasons that people do this. The first is that they love only certain kinds of animals: cats, dogs, guinea pigs… in short: pets. They have made the distinction in their mind that pets are to be loved, while farm animals are to be eaten. The thing to remember here is that there is less of a difference between the animals that we consider pets and the animals we eat than we might think. Pigs, for example, are very smart animals, smarter than most animals we consider pets. Many farm animals not only have the capacity to feel as much as a dog or a cat does, but they exhibit the same type of behavior as the animals we share our homes with. This is not to say that we should all adopt a cow or a pig, and bring him or her into our house. What it does mean is that we should be conscious of the fact that other animals are, in many ways, just like our pets, and respect their right to live. The idea that it’s OK to eat certain animals stems from a very unenlightened time and has been reinforced over centuries. The growth of vegetarianism and veganism in many parts of the world is an active negation of this archaic belief, a new, empathetic approach that recognizes that we should respect all sentient life. While humans, dogs, pigs, and fish are all very different creatures, the fact that we are all sentient beings is the most important factor here, and we should strive to minimize the suffering of such beings, not add to it. There are several other, somewhat related reasons why “animal lovers” eat whom they claim to love, and these are also archaic. One is the idea that we need meat to survive. Someone might claim that he loves animals, but has no choice but to eat them in order to be healthy. This is, again, false. I have written a lot about this (see this essay, or this one), so I won’t rehash the details. To summarize as briefly as I can, you can indeed live a perfectly healthy life on a plant-based diet. The idea that meat (or dairy) is a necessary part of our diet is an outdated one. In fact, there is more and more evidence that meat consumption is worse for our health than we had thought. Another thing to remember is that it is not all right to use and abuse animals for our benefit. While many animal lovers cringe at the idea of eating meat and dairy because they are aware of the death and suffering caused by these industries, the truth behind some of the subtler forms of exploitation of animals still eludes them. A good example is the use of animals in our sports and recreation. Some forms of animal-based recreation are considered more harmful, while others less so. 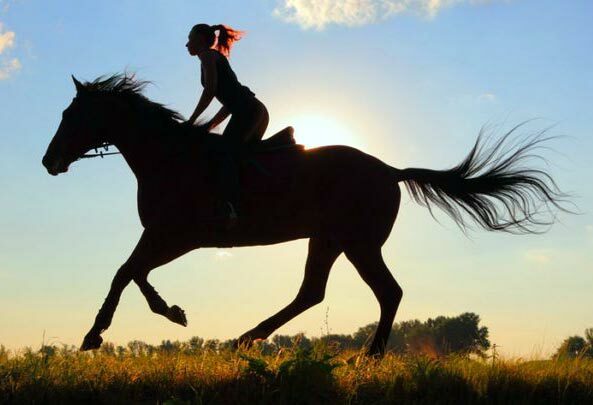 Let's take horseback riding, an activity that many people consider harmless, even beneficial to a horse. Many people who ride horses love these animals so much, they would never willingly do anything to harm them. But, as this article points out, this activity can, indeed, be harmful to horses, and this is something we should consider if we care about their well-being as much as our own. It is not necessary to love animals in order to respect their right to live. We do not love every human being that we do not harm or hurt. We simply do not engage in such behavior because it is unethical to make another person suffer and, on a base level, it just feels wrong. We do not have to love a hen that is forced to lay eggs in a dark factory farm her entire unhappy life, but we can feel empathy for her nevertheless. We can recognize this injustice, and hopefully take steps to end it. One of the best ways to do this is to stop partaking in the cycle of death and suffering by switching to a plant-based diet. Those of us who love animals should, theoretically, be able to do this even more easily. Love is a powerful force that can help us make more ethical decisions. We have been conditioned to accept things as they are, but a reality that is based on suffering and death is one that can and should be changed. If you love animals, think about the things mentioned in this essay, and examine your own choices to see if there are any obvious disconnects between this love, and the reality in which you live.